Paw Print Genetics - My bird dog isn't hunting like he used to. What's wrong Doc? The season of the bird dog is upon us! Whether it's ducks, pheasants, geese or quail, your four-legged, bird-tracking machine needs to be well-trained and in optimal physical health if you want to improve your chances of collecting a limit. You handled the training through hours and hours of sacrifice, treats, frustration and love… and last year it showed. However, this year you are noticing that something is a little off with ol’ Chopper, and you can’t quite place what it is. He seems unmotivated and won’t trail like he did last year. He acts like he’s excited for the hunt, but something is holding him back. Is it a health issue? Do you need to take him to the veterinarian? Given the immense financial, time and emotional commitments of purchasing and training a great hunting dog, wouldn’t it be nice to know that you’ve increased the chances of your hunting companion tracking birds with you late into their adult life? 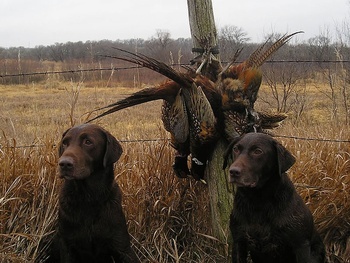 There are many different diseases or conditions that could take a bird dog off his game. Some of the most common ailments such as osteoarthritis, intervertebral disc disease, traumatic injuries and eye problems are called “acquired” diseases and occur without an inherited component. Just like with people, some of these acquired diseases increase in incidence and severity with age as normal aging processes take their toll on the body. Unfortunately, though there are some preventative measures that can be taken, at this time there is no guarantee that your dog will remain free from any given acquired disease as they age. These diseases can arise at various ages and differing severity depending on the particular dog, their environment and their general overall health. Despite the fact that a dog does not show signs of a particular genetic disease, they can still be a carrier of the causal mutation. These carriers can produce affected puppies if bred with another carrier of the same disease. Some diseases have an adult age of onset. Therefore, these diseases are often passed on to puppies without realizing that the dam or sire has anything wrong with them until after numerous litters have been born. Some of the most detrimental inherited diseases for hunting dogs would be those associated with the peripheral nervous system or eyesight. Whether it is degenerative myelopathy of an adult dog, exercise induced collapse in a young pup, or any other disease affecting the nervous system and the brain’s communication with muscles, it is not hard to see how these abnormalities could prevent a bird dog from doing its job. Decreased stamina, abnormalities in gait and balance issues caused by neurological disease are just some of the signs seen that could keep a champion bird dog on the porch. In addition to diseases affecting the peripheral nervous system and movement, inherited diseases of the eye make up a relatively common cause of bird dog retirement. The variety of inherited eye diseases in dogs is vast if you are examining them at the microscopic or molecular level. However, they all tend to have the same thing in common; decreased vision or blindness. Despite vision being a sense of lower importance in the dog in comparison to people (given the dog’s fantastic nose), a dog without good vision is greatly hindered in its ability to mark fallen birds and safely navigate a hunting area. Though they are not the only inherited eye diseases seen in dogs, the most common types of eye disease are those belonging to the large group called progressive retinal atrophy (see the previous “Ask the Vet” blog about progressive retinal atrophy here). I perform genetic testing for CNM on my Labradors, but what is CNM? Which Breeds are Affected by Degenerative Myelopathy? Does Paw Print Genetics do Ichthyosis Testing? Ask the Vet: “I’m confused about the different types of PRAs." "Health Guarantees" when Buying or Selling a Puppy? My dog appears to be going blind. Is it genetic? Does your Brittany have recurring infections?